Dorothy's handcrafted barks are made the old-fashioned way for delicious crispness and unusual goodness. Barks are pure chocolate goodness -- made of our phenomenal Swiss or unusually mild dark chocolate. Barks give you more of what you're looking for -- great chocolaty taste and crunch nuts or luscious fruits -- but no fillers. Our barks are made on cool marbles, by experienced chocolatiers-- a time honored method that no machine can duplicate. Of course, Dorothy's Candies never contain any additives. 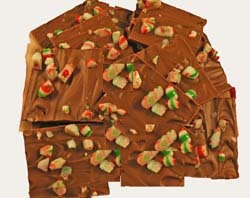 Our cranberry and peppermint barks are a family tradition for the Holidays in homes from coast to coast. From Bill Paulson of DuBois, Pennsylvania on 12/23/2017 . From Rickey Hunt of Bainbridge Island, Washington on 1/13/2012 .